I wrote a toy Perl program which talks to the Keysight U1272A: feel free to play with it! 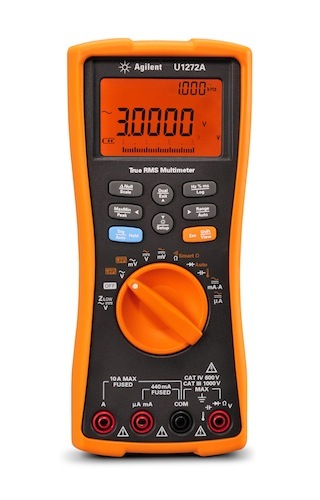 Keysight make a very nice and particularly orange multimeter: the U1272A.2 Like many bits of modern test kit, one can connect it to a computer. In this case there's an infra-red dongle3 which connects the meter to a USB port. Although it's nice to see the current reading, the computer connection is particularly useful in conjunction with the meter's ability to log data autonomously to its internal memory. For example, one can leave the meter recording a voltage every 10s then come back the next day and see the result. We're limited to 10,000 measurements which is roughly a day's worth of samples if they're 10s apart. Unsurprisingly Keysight provide pretty Windows software4 to handle all this, but I use a Mac. Happily kind people have done most of the hard work already. Building on this, I wrote a toy Perl program5 which talks to the meter. In the absence of proper documentation it's far from production quality but you might find it useful or at least fun. I used Failberg's driver, but I should say that I can't and don't vouch for the quality of either driver. Install them at your peril! The key part here is the /dev/tty.PL2303: the serial number which follows is presumably some unique device ID. Once the dongle's installed and you've got a suitable /dev/tty.PL entry, then it's fairly straightforward to talk to it. Inevitably, there's the usual serial configuration mess to navigate. My meter was set to 9600 baud, 8-bit, no parity and 1 stop-bit, but you should check for yourself in the meter's setup (see section 4 of the fine manual9 for details). I tried to set the baud rate to 19200, but failed: I'm not sure why. One other minor issue: if the meter's in logging mode it seems keen to send each reading over the port as it's made. That might be handy for some applications, but it's not compatible with my code. You could of course use this to test the comms though! The Mac isn't well blessed with nice serial terminal emulators, but the screen10 program can be press-ganged into the task. A word of warning: it's hardly user friendly! Stop the logging by holding the 'Hz % ms / Log' button down until the 'LOG' icon disappears. Quit screen by typing CTRL-A k.
Obviously it's a pain to keep typing commands into a terminal emulator, so I wrote a toy utility to save my fingers. Perl seemed a good choice because compiling's a bore, and nothing here is remotely performance critical. Given that the command set is based on SCPI12 I'd hoped to find some helpful Perl modules lying around on CPAN too. A couple of things seemed as though they might help: GPIB13 and Lab::Instrument.14 Sadly though, neither actually helped. Both packages are large and quite complicated: GPIB seems to have suffered bitrot and didn't compile, whilst Lab::Instrument wants an underlying C library. All of this seems rather large and baroque: the SCPI spec runs to nearly 1000 pages, and both of Perl libraries bristle with classes. If you're building a big experiment I can see the sense in this, but I just wanted a simple way to tickle the serial port. So my toy program15 is a thin wrapper around Device::SerialPort16 It's a noddy program, very much in the `send a line, read a line' style, but knows enough to handle error conditions from the meter, and to iterate through the saved data log. I should emphasize that it's not proper production quality code though: regard it more as research than solution. For example, the code assumes that there's just a single /dev/tty.PL* device and that it corresponds to the Keysight meter. A more significant limitation is its failure to do much parsing of the data coming back from the meter. The basic command queries the meter for some basic data. You'll notice the absence of any parsing! Probably the single most useful task for the program is to grab the meter's data logs. The --get_log option does this, but the returned data are parsed very crudely. Please check the output carefully. Specifically we read the entire log and write it to a text file, one measurement per line. The meter returns a string of digits like "AABBBBBCCCCCC" for each datum, where BBBBB contains the measurement. This is written to the file as NNNNN BBBBB AA CCCCCC, where NNNNN just counts upwards. The graph below was produced using the code. It shows the voltage across an alkaline AA cell as it's cruelly discharged through a small resistor. Data were logged every 10s by the meter, then the logs downloaded to the computer. The data were scaled, then plotted with gnuplot. There's a real pleasure in measuring and plotting 1700 points so easily! As you'll have seen, very little of this is Mac specific. I expect it would work as-is on a Linux box and there are some suggestions that a suitable USB driver is already baked into the kernel. Device::SerialPort is supposed to emulate the API of the Windows specific Win32::SerialPort18 module, so perhaps a Windows port wouldn't be hard either. On the device side, Keysight's official software claims to support the U1230 and U1250 as well, so perhaps they'd work with this software too. Revised by Martin Oldfield on 22 Jun 2015, original version 19 Jun 2011. This work is available under the Creative Commons Attribution-ShareAlike 3.0 Unported License. The image of the U1272A comes from Keysight: Reproduced with Permission, Courtesy of Keysight Technologies, Inc.